Craig Milford (Warbeck) is a Miami-based TV reporter who thinks he’s seen it all. That is, until he gets involved in a complex plot that involves DNA from an alien race, the businessmen that want it to control the world, the malevolent extraterrestrial fetus that holds the powers, and a telepathic lady, Joanna Fitzgerald (Trotter) who can help him communicate with the forces from the universe that are commanding him to get the vital information away from Anderson (Ireland) and his goons. At first, Milford is skeptical, but as he goes on his journey of discovery, it does turn out that space aliens have chosen this lowly local TV reporter to be the one that will save all life in the universe. Will Craig Milford be up to his immense task? Miami Horror, also known as Miami Golem, was an Italian production directed by Alberto De Martino (using the pseudonym Martin Herbert) and picked up for release by AIP. The tape contains no AIP trailers. But whoever designed the logo used for the movie was clearly “inspired” by the then-hot Miami Vice TV show. 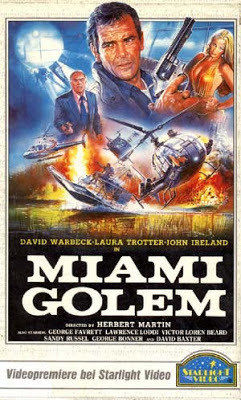 Such was the power of Crockett and Tubbs, it even filtered down to bizarre sci-fi/horror/action hybrids such as this, which really have no connection to the show whatsoever. Even the music by Detto Mariano is decidedly Jan Hammer-esque. Miami Horror is a nutty movie, notable in its own right for its weird touches and strange effects, not to mention its grab-bag of a plot that’s quirkily entertaining one minute, and oddly slow the next. The great David Warbeck is always charismatic, and he basically carries the movie. This time around he’s being shuffled between intergalactic commanders and being chased by rednecks with shotguns as he escapes on a fan-boat. One thing you can say about Miami Horror, it’s never predictable. When he’s not talking on his awesome car phone, he’s shooting with a handgun at a helicopter that is chasing him in a sequence seemingly inspired by North By Northwest (1959). But does the heli explode? You’ll just have to track down the movie to find out. It’s really hard to describe Miami Horror - its off-kilter, off the wall, and off beat vibe is...off the beaten track and fans of Italian productions from the 80’s should appreciate what’s going on here. Some people say Italian productions “ripped off” other, more popular movies and shows in order to exploit their current popularity. But as is evidenced here, that may be a starting point, but - just like the musical score - the final product is something strangely original. No one can deny that when all is said and done, there is no other movie like Miami Horror. Add to that some classic dubbing, some scientist goons fistfighting, and American Commandos (1986)-style repeated footage (not to mention all the other wacky ideas being floated around) and there you have it. 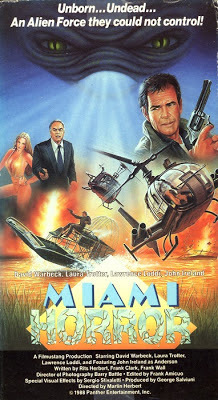 While it might not be to everyone’s taste, Miami Horror is still around for people out there that have seen all the other Italian productions of the 80’s and are still seeking out what’s left. I am one of those people! Sounds interesting. It is definitely worth-watching Gotta love Warbeck! I read about this in a back issue of Fangoria, might have to track it down. Very cool! Hope you can find the issue. Thanks! It's a very odd movie, they don't make them like that anymore.